At Artistic Dental, we emphasize family dentistry — that means we’re here to help you get the best dental care possible, from the first toddler appointment through that conversation about dentures. Our highly-trained dentists work closely with our experienced dental staff to bring you comprehensive family dentistry that you can count on. 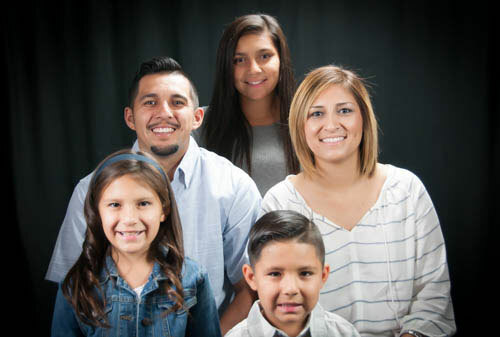 We are dedicated to taking care of your family’s oral health, beginning with cleanings that make your teeth sparkle to corrective procedures that restore your mouth’s overall health. It is often recommended that children have their first appointment by their first birthday. This is more for the parents than the child, as we check on the growth and development of those first teeth, make sure there are no early signs of decay, and provide guidance about nutrition and oral hygiene to keep their child’s teeth and gums healthy from the beginning. It isn’t until about age 3 that regular visits and cleanings begin. To learn more, here is a preview to a baby book that patients can pick up at our office. Preventative care will protect your baby’s smile now and in the future. Once children begin regular six-month exams and cleanings, we can apply sealants, which act like a plastic, protective coating to the chewing surfaces of the back teeth. The application of sealants is a quick and painless process and studies show that sealants can reduce tooth decay by as much as 100%. We continue sealants as new back teeth come in, until about age 13, when most kids have all of their adult molars. Our main concern is plaque, gum disease, and tooth loss, which we address at regular dental visits. Removing the build-up of plaque that accumulates between dental visits is routine and generally painless, as long as you are brushing and flossing regularly. When a cavity does surface, filling it can be simple process — unlike the complex procedures required when cavities and tooth neglect turn into dental disease. Regular visits will save our patients unnecessary pain, expense, and time. Many don’t realize that most dental problems won’t have any symptoms until the problem reaches advanced stages, when they require more invasive treatment, as well as a bigger commitment of time and money. To help prevent this situation, we try to educate our patients and emphasize the importance of consistent care through each age and stage of life. During the pre-teen and teenage years, we will discuss dietary habits and choices that can damage teeth. We will also evaluate the need for orthodontics and determine if wisdom teeth will need to be extracted down the road. As we age, the benefits of keeping our teeth and gums healthy can have considerable impact on overall health. Adults and seniors may begin taking medications that can cause dry mouth or have other effects on the teeth and gums. Fillings and crowns may need replacing. You become more susceptible to gum and periodontal disease and may be at greater risk for oral cancer. As a result, check-ups at least twice a year are vital for older adults. Achieving and maintaining a healthy mouth is a team effort. We feel it’s very important for our patients to have an effective home care routine. There is no way around it: proper brushing and flossing are essential. We also count on you to keep your regularly scheduled dental cleanings and exams. It’s at these visits that we are able to do our part. In order for our doctors to properly diagnose any condition that may need attention, we take only the most necessary x-rays at the proper intervals. Our office has always utilized the latest digital x-ray equipment so you can be comfortable knowing we are doing all we can to limit any x-ray exposure. Click here to read more about dental x-rays. Our dental hygiene team has over 75 years of combined experience and are committed to your overall well-being and comfort. Patient education is a high priority when you are at your dental appointment and we are happy to share the latest information about new products and devices. Electric toothbrushes with bluetooth technology and fun brushing songs for the little ones are just some suggestions we recommend for at-home motivation! We are dedicated to educating our patients and preventing oral cancer through screenings during our patients’ regular check-ups. When we pull and tug on tongues and lips, it is not to make you uncomfortable; it allows us to see areas of the mouth hidden from view. Signs of oral cancer are not always visible sores or painful lumps, and seeing a dentist for periodic exams is crucial for early detection and prevention. We are here for you, for your family, and for your friends. Let’s talk, let’s be aware, let’s fight this cancer! For more information on oral cancers and research, see Oral Cancer Foundation. We know it’s not always comfortable when our dentists and hygienists are poking around your gums, but when they conduct periodontal exams, they are measuring the depth of your gum pockets to determine if gum disease and infection is present. When the hygienist calls out a number between 1 and 3 mm, your gums are typically in a healthy status and a regular dental cleaning (prophylaxis) can be done. If it’s a 4, 5 or 6, you most likely have gingivitis or periodontal disease. You may not notice anything wrong, as periodontal disease is often painless, but puffy, bleeding gums and bad breath are an indicator and a big concern if you plan to keep your teeth. A procedure our dental hygienists perform called scaling and root planing, along with future maintenance, can greatly reduce the chance of losing even one tooth! To learn more about periodontal disease and treatments, click here. Restorative dentistry is used to repair teeth that are decayed and broken. Restorative procedures use long lasting materials such as porcelain or resin to fix damaged or replace missing teeth and restore your smile to its natural beauty. These procedures can include fillings, crowns, veneers, or implants, and when done and maintained correctly, can last for many years. Simple restorative procedures, such as fillings, may be completed in one appointment, while more complex procedures like bridges or veneers may require several appointments to complete. Whether you need one filling, or a full set of veneers due to chips or staining, our highly trained dentists have you covered. If you need a root canal, don’t be alarmed. Our dental team is highly trained and experienced in this area. We’ve all heard stories, but most of the time a root canal experience is a procedure not much different than having a filling or crown done. Root canals are needed when decay has reached the nerve of a tooth or when the tooth is dying, possibly due to prior trauma. When this is the case, the dentist will need to access the nerve through the biting surface of the tooth and clean the inside of the roots before filling them with a rubber-like filling material. A dental crown (cap) will most likely be needed after a root canal. To learn more about endodontics and root canals, you can check out our blog and you can always ask questions. We are here to help. When your tooth cannot be saved by a root canal, when keeping your wisdom teeth is unwise, or you’ve lost a tooth and need it replaced with an implant, you will need oral surgery. We know no one likes having a tooth pulled, but we will do all we can to put your concerns at ease and make sure you are comfortable. Most of the time, local anesthetic is all you need to numb the specific area and our dentists can do the extraction. If the treatment required is more complicated or you are in need of IV sedation for other reasons, we may refer you to one of our specialists, but the majority of cases can be handled in our office. If you have a tendency to clench and grind your teeth, you wake up in the morning with a headache, or the dentist notices your teeth are showing wear from grinding, an occlusal guard may be recommended. If you have a tween or teen that plays a contact sport or you are in a sports league, it is wise to wear a mouth guard to protect your teeth from fractures, dislocation or other injuries. Protecting teeth at all stages is important and whether you choose to wear a “boil and bite” from the sports store or a custom one made by us, commitment to wearing it is the best practice. At Artistic Dental, we can make a custom mouth guard that molds snugly to your teeth and provides the best prevention from injury, but we do not recommend this option until all permanent teeth are in place. When you come in for your dental check-up, bring your mouth guard with you, regardless of type or where you got it, and we will give it an extra deep cleaning.